Nova Direct will run your database against our in-house, data cleaning software including PAF, MOS and De-Dupe at no cost to you throughout April and May. The next time you do a mailing, you wont be wasting the costs of postage and production for duplicate or wrongly postcoded files. Add to that the increased response rates from correctly targetted and addressed recipients. Your database will be more valuable because your mailings will be much more cost-effective. By running the data through our MPS suppression software we will ensure that you won’t generate complaints from customers and prospects. 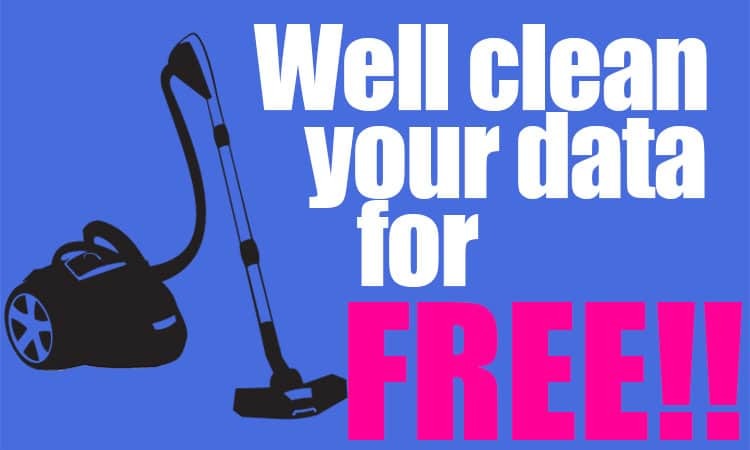 Our FREE offer, to clean your data, will help to maintain your brand’s good name and reduce your administration costs from complainants and ‘gone-aways’. We will also tell you how many deceased, gone-aways and home movers are in your database so you can decide to remove or update them at a discounted rate of 20% off our usual prices. This offer applies to Business and Consumer records and is limited to one database assessment/update per customer up to a maximum of 10,000 records unless agreed otherwise by both parties. We will check your data against the Post Office Address File (PAF), Mailing Preference Service (MPS) and Royal Mail Mailsort applications where appropriate and return an updated file in the same format. Any duplicate records will be flagged. We will also provide a report to show how many records need updating. We will provide an assessment to show Deceased, Gone Away and Change of Address details free of charge but any updating or removal of records will be charged at our standard rate less 20%. We have a legal responsibility to comply with the terms of the Data Protection Act (1998) and reserve the right, at our discretion, not to accept or update data. All data provided should be in an easily readable format. This offer is open to UK business until 30th March 2016.